About the Victorian Association for Dispute Resolution. 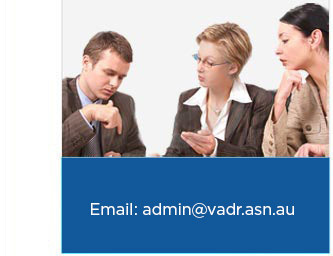 VADR embraces a range of dispute resolution methods such as Negotiation, Facilitation, Mediation, Conciliation and Arbitration. VADR provides an accessible, equal meeting point for Members with all levels of training and involvement in ADR. VADR actively encourages debate, education, training, research and professional best practice in ADR at all levels. Click here to obtain a copy of the 2017 President's report. These standards which apply from 1 July 2015 need to be read thoroughly before applying for national accreditation. Click here to download a PDF file of the NMAS Approval and Practice Standards 1 July 2015. Joined VADR? Need personal indemnity insurance as an accredited mediator? Go to our members area to take advantage of a special offer. This Complaints Policy is designed to provide the public and VADR members with an avenue of redress in regard to any VADR member, engaged to conduct a mediation or other alternative dispute resolution process, who does not meet VADR Code of Conduct standards. Click here to download a PDF file of the complaints policy and procedure.